What Are The Health Issues In The Migrant Caravan? : Goats and Soda At a rest stop in Mexico City, adults are treated for respiratory and stomach bugs. Their feet are in bad shape. There's anxiety and fear among adults and children. But ... definitely no smallpox. "We're mostly seeing people with respiratory infections and problems in the GI tract, like diarrhea," says Ruben Rodriguez Romero, the Mexico City coordinator for the Mexican Red Cross. The polluted air of Mexico City could be responsible for some of the respiratory infections. Kelly Zelaya, a 31-year-old Honduran, says she's been struggling to breathe normally, which is particularly difficult on days when she walked as many as 25 miles in 90-degree-plus weather. "I've had a really bad cough and flu symptoms," Zelaya says. "I just couldn't keep walking some days because I couldn't breathe." As the sun beats down, migrants line up at various tents for treatment. Inside a Mexican Red Cross ambulance, an EMT cleans off the cracked, swollen, bloody big toe of a migrant who has come this whole way in a off-brand version of Crocs. The patient cringes as the EMT sprays more disinfectant on the toe and continues to scrape away the dried blood. Once the cleaning is done and the toe is bandaged up, they tell him to go see the city's mobile pharmacy for antibiotics. They worry his toe might have an infection. The Mexican Red Cross, with a rotating staff of 30 doctors and EMTs, is one of many organizations providing aid for the migrants in Mexico City. While aid to the caravan was fractured and sporadic as they made their way through southern Mexico, the capital's government coordinated with dozens of non-profits for what they're calling the "Humanitarian Bridge." 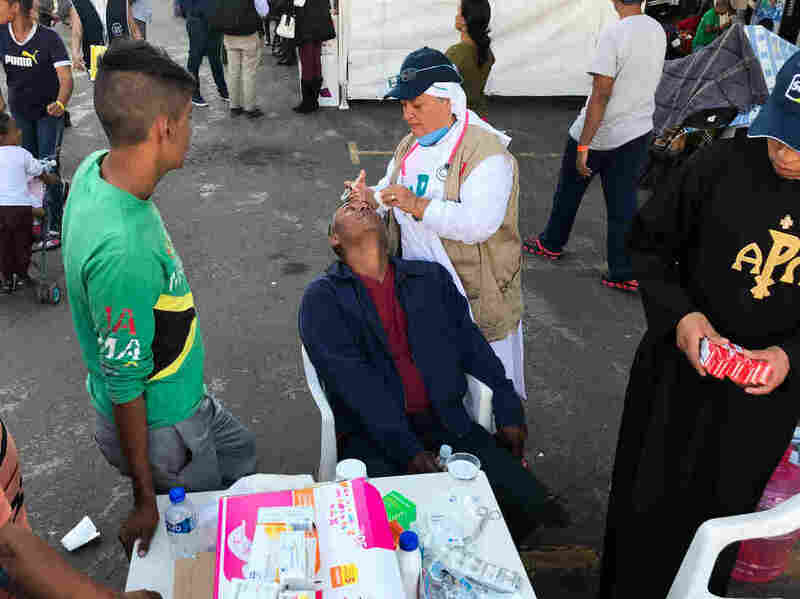 Mexico City's health ministry has deployed 51 doctors, 14 epidemiologists, 37 nurses, 14 psychologists, and 12 dentists to provide free care. It set up mobile consultation rooms, mobile dental clinics and a mobile pharmacy at the stadium where the migrants are resting. As of November 8, the government's tally is: 1,380 doctor visits, 1,295 flu shots, 275 tetanus and diphtheria shots. Nonprofits have given hundreds more consultations. "We just got [flu] shots, we got some medicine for headache and body aches, something for the cough," says Jorge Luis Sanchez, a 23-year-old Honduran, as his girlfriend coughs into his shoulder. "Mexico City has been really different from the rest of the country, better care, better and more food, there's medicine, it's more orderly," he says. He hopes the shots will prevent them from catching the flu again since he has seen lots of people in the caravan with symptoms. Over in a corner of shade left by the stadium is a familiar face for the migrant caravan: Sister Bertha Lopez Chavez from the Missionaries of the Risen Christ order. Her group of nuns and priests began working with neglected AIDS patients in Mexico in the 90s and has recently focused attention on migrants. They've been traveling with the caravan since Guatemala and are one of roughly 50 nonprofits providing aid to the migrants during their pit stop in Mexico City. "I'm dehydrated, I've got a cough, I think I have a fever, I've got a headache, my body aches, my feet hurt," he manages to say before his cough kicks in again. "Drink all of this," she says through a medical mask, handing him a glass of rehydration solution. He gulps it down. "Now drink another glass. I want you to drink as much water as you can stomach and take this." She hands him ibuprofen. "And then go over to the doctor's tent as ask him if you have an infection. You may need antibiotics." For the vast majority of patients, the goal here in Mexico City is to get well enough to keep up with the caravan's grueling journey. "We've tended to thousands and thousands of people at this point," says Sister Bertha. "We're just trying to deal with their basic needs so they can continue on." "Both the babies got fevers, one around 102 degrees," says Evelyn Perdomo, 30, a Honduran woman traveling with her mother, younger sister, her three children, and a niece. "The caravan was leaving at 3 a.m. and we were still in the hospital. We just couldn't keep going." Physical health isn't the only challenge, says Marlen Nava Miranda, a psychologist and the director of the Mexican Institute for Emergency Psychology, a nonprofit group working at the stadium in the capital. "These people are all suffering losses: loss of their country, their culture, family, maybe children," she says. "They are wracked with fear, guilt, uncertainty and anxiety." "Kids are suffering from attachment anxiety," says Nava. "If they lose sight of their parent or family member for just a moment, they panic and think they've been abandoned. A lot are suffering from nightmares and aren't sleeping." But there's only so much psychological support that can be given in the few days the caravan rests in Mexico City, with hundreds of miles remaining to the border. "What we're trying to do is give support and stability, to help lower stress and anxiety levels so they can be functional and make clear decisions," says Nava. But whether they're suffering mental or physical problems, migrants here are largely determined to keep moving north towards the U.S.
"I'm just trying to rest up to continue to the U.S.," says Marcos Dario through his hoarse throat. "I'm even more motivated [to reach the U.S.] after what I've been through," says Kelly Zelaya, who's suffering from bronchitis. "God will help keep us healthy."